To learn more about the history of Medard de Noblat, please click here. Porcelain is a material that is perfectly suited to everyday life. It can safely be put in the dishwasher, which will not hurt the decoration, but give it a radiant shine. Great care must be taken when putting a porcelain dish in the oven. 1400°C fired porcelain can withstand your oven's 300°C, but not thermal shocks. When you take it out of the oven, do not run cold water on it and avoid putting it on a cold surface, lay it on a wooden or material-covered surface, or on a cloth. 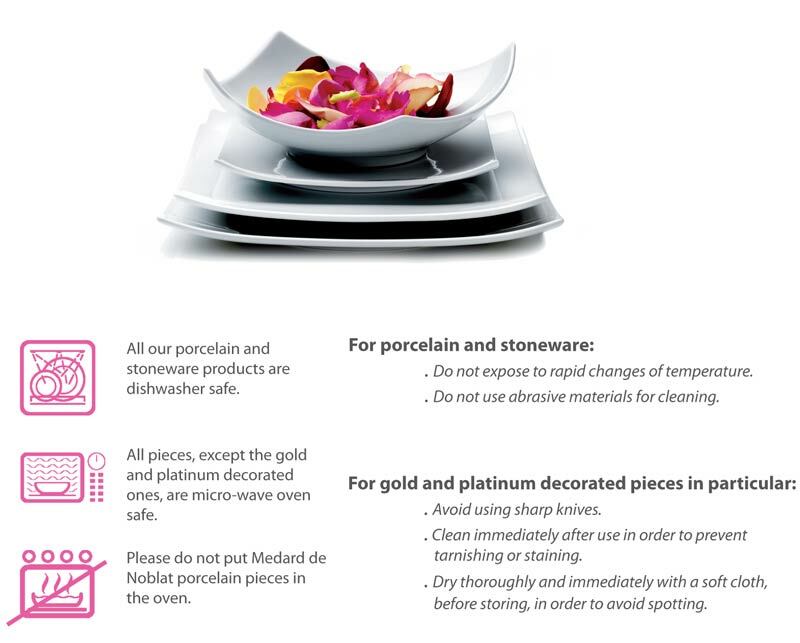 As for microwave ovens, you must make sure there is no metal (gold or platinum) on the decoration - Raynaud does not today make decorations with microwave-proof fake metal. Only white or color decorations can go in the microwave. Be creative in your use of the various pieces, for instance... a presentation plate can be used as a single-dish dinner plate, as a cake plate, a cheese plate... the dessert plate is perfect for an appetizer or cheese, the fruitcake dish is ideal for "pâté" and also "canapés", "petit-fours" and smoked salmon. The soup tureen is today used for soup, "consommés", "bouillabaisse", "pot-au-feu", pasta... all the convivial and generous dishes. Salad bowls are also very practical for pasta, risotto... sauceboats can be used for fruit sauces. Exotic cuisine is very fashionable, and if you don't have a Thai dinner every night, remember that the bowls will look lovely filled with "hors d'œuvres" or sauce, and the cups can turn into sugar bowls.